International collaborators advance physics basis for tokamak plasma confinement at low rotation, potentially benefiting a fusion reactor. Confining a fusion reactor’s plasma (similar to the matter at the heart of a star) in a doughnut-shaped magnetic bottle, known as a tokamak, without relying on the benefits of plasma rotation has been a long-standing challenge. The challenge is because fusion reactors that would be used for energy production are projected to have low rotation. For decades, experiments showed that the confinement degraded when the rotation was reduced. When the rotation slowed, the plasma become more turbulent and energy leaked out faster. 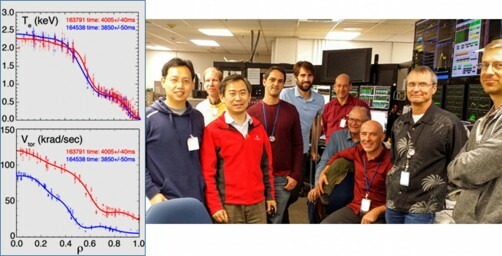 Scientists have discovered a new steady-state plasma operation regime at the DIII-D National Fusion Facility that suppresses turbulence via magnetic shear and does not rely on rotation. In the new plasma operation regime, the beneficial effect of rotation shear is replaced by magnetic shear. Magnetic shear also opposes the formation of large turbulent eddies, which are a concern in fusion reactors. Maintaining a high degree of plasma confinement without plasma rotation could enable the economically attractive operation of a steady-state fusion reactor. The low transport achieved in these studies leads to very high levels of performance through a “transport barrier” in the plasma, approaching plasma parameters that would be required in fusion reactor power plants. A collaboration of U.S.- and China-based magnetic fusion scientists is developing the physics basis for maintaining excellent energy confinement even in low-rotation plasmas where confinement normally suffers. In joint experiments on the DIII-D tokamak (San Diego, USA), scientists demonstrated an operating scenario known as “high poloidal beta (βP) scenario.” The scenario achieves improved energy confinement quality relative to standard H-mode (H98≥1.5) through the formation of an internal transport barrier at a large plasma radius. The confinement persists even at low plasma rotation. To achieve this result, the international team systematically analyzed the influence of toroidal rotation, plasma pressure, and current profile on turbulence suppression both in experiments and simulations. They discovered that in this scenario, a toroidal plasma characteristic known as the Shafranov Shift, which is proportional to the plasma pressure normalized to the poloidal field pressure, is responsible for turbulence suppression and the formation of the large-radius (r≥0.7) internal transport barrier. In Shafranov Shift stabilization, rotation plays a minor role in turbulence suppression. Transport simulations are in excellent agreement with the DIII-D experiments. The agreement gives confidence in the interpretation of how the mechanism works and in predictions for scenario extension. Experiments to adapt the DIII-D scenario on the superconducting tokamak EAST (Hefei, China) have led to the realization of the first 61 sec pure radiofrequency wave heated fully non-inductive H-mode with internal transport barrier features, an important first step for extending this scenario to long pulse high performance. Modeling using the trapped gyro-Landau-fluid transport code shows favorable projections of the high bP scenario to burning plasmas in ITER and the China Fusion Engineering Test Reactor. This work is supported by the U.S. Department of Energy, Office of Science, Fusion Energy Sciences under cooperative agreement DE-FC02-04ER54698. This work is supported by National Natural Science Foundation of China under grants 11575248, 11305209, and 11575246. This work is sponsored in part by National Magnetic Confinement Fusion Science Program of China under contracts 2015GB103001, 2015GB102004, 2015GB101000, and 2015GB110001. This work is also sponsored in part by the Youth Innovation Promotion Association Chinese Academy of Sciences (grant 2016384). Research was done in the DIII-D National Fusion Facility. A.M. Garofalo, X. Gong, B.A. Grierson, Q. Ren, W.M. Solomon, E.J. Strait, M.A. Van Zeeland, C.T. Holcomb, O. Meneghini, S.P. Smith, et al., “Compatibility of internal transport barrier with steady-state operation in the high bootstrap fraction regime on DIII-D.” Nuclear Fusion 55, 123025 (2015). Q. Ren, L.L. Lao, A.M. Garofalo, C.T. Holcomb, W.M. Solomon, E.A. Belli, S.P. Smith, O. Meneghini, J. Qian, G. Li, et al., “Test of bootstrap current models using high-βp EAST-demonstration plasmas on DIII-D.” Plasma Physics and Controlled Fusion 57, 025020 (2015). S. Ding, G.S. Xu, Q. Wang, W.M. Solomon, Y. Zhao, X. Gong, A.M. Garofalo, C.T. Holcomb, G. McKee, Z. Yan, et al., “Scenario development for high βp low torque plasma with qmin above 2 and large-radius internal transport barrier in DIII-D.” Nuclear Fusion 57, 022016 (2017). C. Pan, G.M. Staebler, L.L. Lao, A.M. Garofalo, X. Gong, Q. Ren, J. McClenaghan, G. Li, S. Ding, J. Qian, et al., “Investigation of energy transport in DIII-D High-­βp EAST-demonstration discharges with the TGLF turbulent and NEO neoclassical transport models.” Nuclear Fusion 57, 036018 (2017).